Operate a 507 service to Dundas West Station overlapping 501 Queen service between Humber and Roncesvalles. Needless to say, TTC staff recommend against any changes. Short turns of 501 Queen cars at Sunnyside leave a gap in the route and cause highly unpredictable travel times for passengers trying to transfer between the 501 and 507 in either direction. Since the construction of much new development on The Queensway, the provision of reliable service is more important than ever. Move the transfer point east from Humber Loop to Roncesvalles. Provide additional service on The Queensway that is not affected by short-turns further east. Provide additional service on Roncesvalles to partly compensate for the frequent short-turning of 504 King cars (once that route returns to its normal configuration). The restored 507 route would operate with CLRVs freeing up five ALRVs for use on the 504 King route. This is the equivalent of adding 2.5 CLRVs worth of capacity to the 504 in the peak period, but no value is attached to this by the TTC. Service would be improved between Humber and Roncesvalles, and between Queen and Bloor on Ronces. This is stated relative to the scheduled service, but a good deal of this service never actually reaches the terminals especially when there are disruptions downtown. Nearly 10,000 trips per day would benefit from these improvements. A small number of trips between Lake Shore Blvd. and the Bloor/Dundas area would have one less transfer. The TTC does not mention the benefit of reliable service on Lake Shore, the value this would have in reduced wait times for riders there, and increased riding that could result. About 2,500 trips per day that travel from points east of Roncesvalles to west of Humber Loop would be inconvenienced by this arrangement, an that about 300 rides per day would be lost due to this change. When I first proposed the 507 Dundas West service, the scheme included improved service on the 508 specifically to preserve through trip options. This was not included in the scheme the TTC reviewed. There would be little benefit for the Neville-Humber service because the west end of the line is not a source of congestion and service disruption. This is exactly the reason for splitting off the 507 service so that it can benefit from the relatively trouble-free environment. Also, with the 501 service having shorter trips, operators would not be faced with interminable runs across the city before they get a break. The TTC claims that sharing the platform at Dundas West between the 504 and 507 services could cause delays similar to what happened when the Dundas and King routes shared a common track. I beg to differ. First, the 507 service is less frequent, and there is a runaround track available if a 507 is so early arriving at Dundas West that it would hold a King car from leaving. After all of this, the report concludes that “overall, the change would make service better for customers”. However, the TTC rejects the scheme because it is estimated to have a marginal cost of about $825k annually. As mentioned above, they give no credit for the value of the additional capacity provided on the King line by reassignment of equipment nor for the ridership effect of more reliable service. Indeed, the only ridership change the TTC cites is the potential loss of 300 rides per day from the loss of a transfer-free trip through Humber Loop. In discussing the route’s history, the TTC states that the amalgamation in 1995 was intended to eliminate the transfer at Humber. What they omit is that this change was made primarily to reduce operating costs. The decline in service quality west of Humber has long been a complaint from the community, and it is a direct result of the restructuring coupled with general service cutbacks on streetcar routes through the 1990s. The report includes a chart showing ridership declines on the route, and the TTC argues that the fall occurred before the routes were amalgamated due to declining employment. The TTC neglects to mention a large cut in service on the Long Branch car in the early 1990s that drove away riding even before the route’s amalgamation with the Queen car. An important note about the Long Branch route, something evident in a previous TTC report on the subject and to anyone who rides the line, is that there is considerable local demand that never gets east of Humber Loop. Service that is managed (and short turned) on the basis of somewhat empty vehicles at Roncesvalles will short-change riders who don’t board until west of Humber. This is particularly so during off-peak periods. The TTC report is self-serving with selective analysis intended to put their preferred option, do nothing, in the best possible light. At a minimum, the TTC needs to carry out a trial operation of the 507 Dundas West option following restorarion of streetcar service on Roncesvalles late in 2010. This trial needs to run long enough to allow meaningful analysis. A related service change should be improvement of the 508 Lake Shore route to provide more through peak period trips to and from downtown via King Street. In June 2005, I appeared at the TTC meeting and spoke about problems with transit signal priority on the Spadina-Harbourfront line. At that time, then Vice-Chair Olivia Chow request a report from TTC and City staff addressing, among other things, the issues I had raised. This report has appeared on the list of outstanding Commission requests ever since. It was supposed to be on the March agenda, but was nowhere to be seen. Now, we learn it will be on the September 30, 2010 agenda. With the amount of flak the TTC and City have taken about the design of LRT lines and signal operations particularly, one might think this issue was of some interest and priority. Place your bets now on whether we see anything by September 30, and enjoy your ride on our “priority” transit routes. On Wednesday, April 28, I presented a Webinar for the Maytree Foundation that is based on my planned (but as yet incomplete) series “Transit 101”. The Webinar itself together with a longer version of the slides (including talking points and additional topics that were not covered in the presentation) are available at Maytree’s website. Queen’s Park has announced that it will build the four previously funded Transit City lines (Sheppard East, Finch West, Eglinton and the SRT rebuild/extension) as well as the VIVA busway, but over a longer time than planned. Tess Kalinowski writes about this in today’s Star. Sheppard and VIVA are already underway and will continue. The SRT will continue operating until after the Pan Am Games in 2015 at which point it will close for reconstruction. Second-hand Mark I ICTS cars will be purchased from Vancouver to supplement the existing fleet in the interim. Also rumoured is a Metrolinx announcement regarding purchase of cars for these lines from Bombardier. All of the details will come out at the Metrolinx Board meeting on May 19, 2010. The City of Toronto has proposed that it would finance the projects starting on the original schedule as this would be cheaper than other capital expenses it would have to undertake (a larger bus fleet and a new garage) to handle system growth pending opening of the Transit City lines. One might argue that they should just “get by” if this would only be a short-term pressure, but if Queen’s Park’s new promise falls through (there might be a different party in power by the time in came to actually pay up), the TTC would be seriously behind in providing capacity. Rob Prichard of Metrolinx argues that the financial goal is to minimize provincial debt, and starting the projects early would add to the debt regardless of who pays the interest costs in the short term. This is really the nub of the debate. Queen’s Park seeks to minimize its book debt, and must deal with accounting standards that no longer allow governments to hide debt through leases or third-party financing. Oddly enough, this also affects some privatization schemes because, ultimately, the government is still on the hook to pay for the lines. There are much larger questions in play here. Metrolinx “Big Move” plan includes over 50 projects, and we have no idea of how Queen’s Park will pay for them, much less operate the network once it is built. If the first five projects are stretched over the next decade, when will work begin on the others? Will any new revenues (tolls, taxes, the Tooth Fairy) be used to fund additional projects, or will they backfill the original five? Metrolinx’ mandate for a financial plan was explicitly set up to keep funding issues off the radar until after the 2011 provincial election, but that idea (a triumph of politics over good planning) fell apart when the 2010 budget cut funding for transit. On top of this, there is no word on a provincial role in funding operating costs of local transit systems. In a best-case scenario, this might show up in the 2011 budget as a pre-election goodie, but Toronto and the TTC will go into their own budget cycle (which is largely complete by the time Queen’s Park announces its own plans) facing a TTC operating subsidy of about half a billion dollars. Mayoral candidates have a lot to be worried about, and they won’t solve the problem by counting the pencils. This morning, the TTC held a press conference at Broadview Station to launch the rollout of next vehicle information on the streetcar network. This was something of a non-event given that all we had to look at was one small text display on the platform for the 505 Dundas car and two of the familiar video screens showing expected arrival times for 504 King and 505 Dundas inside Broadview Station. Oh yes, I mustn’t forget to mention that the display out on the shelter is solar powered. It will be intriguing to see how well it works next winter. The announcement neglected to mention that you can obtain the same info online. Go to www.nextbus.com. Depending on the behaviour of the browser you are using, you will be taken directly to your most recent selection if you have been to NextBus before. Otherwise, you will have to navigate to the TTC for your first time in by selecting “Ontario” and then “Toronto”. It’s a good idea to bookmark at least one lookup (preferably one you want to use regularly) to save on the navigation if your browser won’t “remember” where you have been. While I was at Broadview, I noticed that the information on the display did not match what was actually happening with the cars. This was sorted out by a conversation with the NextBus folks. What they are displaying is a predicted arrival time as this is what people want to know at regular stops. Terminals are a bit odd in that vehicles arrive and then tend to sit for a while. They will show up briefly as “Due” and then the display will drop them and show the time for the following vehicle. This could be confusing especially to someone looking at the video screen inside the station where it is not immediately obvious, especially to a rider unfamiliar with the station, that a vehicle is actually at the platform. (Indeed a bus may not actually be at the platform but hiding somewhere for a break.) This information needs to be added, and will be especially valuable in large terminals where displays and vehicle bays may be quite some distance apart. If someone is waiting for the “next” bus and it has already “arrived”, and will depart (according to the schedule) in five minutes, people need to know this. A display panel about the size of a TTC route map was installed beside the route map last fall. It is still empty. The Station Vicinity map here (and everywhere else on the system, except where ancient ones were never removed) is still missing in action. These were to have been replaced last fall after the debacle of the many inaccurate maps posted by the TTC. Maybe the Customer Service Panel will fix this. Finally, it’s almost May, and there is no sign of any work of the long-closed second entrance to the station. 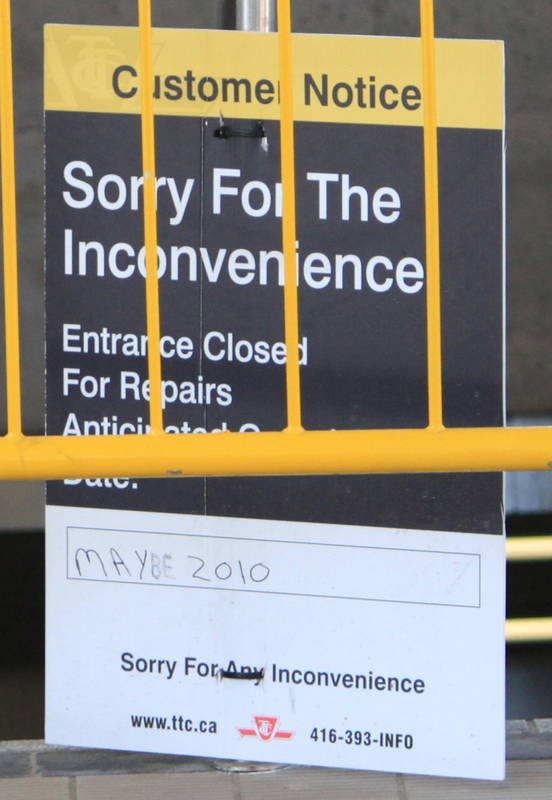 There is a sign on the barricade saying it will re-open in May 2010, but this has been discretely modified, possibly in the interest of clarity. Saturday, May 1, 2010 brings the 30th birthday of the Metropass. Then a strange thing happened. Hamilton, little often-ignored Hamilton down at the end of the lake, got a monthly pass. If it could work there, why not in Toronto? 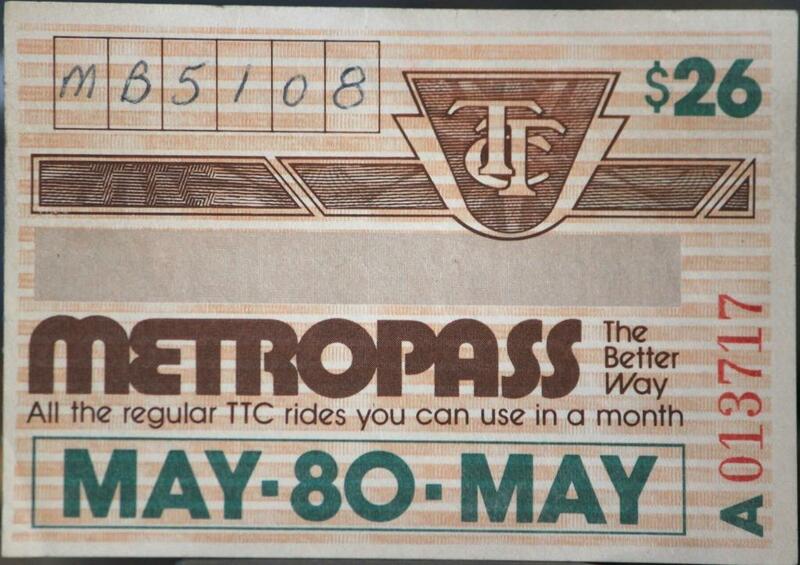 Metropasses now account for over half of the rides taken by adult customers on the TTC. With some luck we may see a shift to some form of smart card (that’s an article in its own right) and a much more flexible fare system on the TTC sometime this decade. On Saturday, go have a coffee and a small pastry of your choice with a little candle, and sing Happy Birthday to your Metropass! Yesterday evening, a full crowd at Toronto Council Chamber chanted the words “Save Transit City”, the mantra-de-jour of the Public Transit Coalition. This was a rousing meeting, a rally to spur people to get out and develop support in their communities, and it ended with a surprise visit from David Miller to send everyone out in high spirits. Some media and political reaction was quite predictable and treated this as an event to be ignored by all right-thinking folks and especially by Queen’s Park. MPP Glen Murray was there to put a goverment spin on the situation by claiming that all of the projects are still going ahead, and we’re only having a short delay while the treasury recovers from recent unpleasant circumstances. Would that it were so easy. Already, word is leaking out of Metrolinx that some Transit City routes are on the chopping block. Not deferred. Cancelled. The Scarborough RT will never reach Malvern because it won’t be rebuilt, merely re-equipped with aging second-hand cars from Vancouver. Eglinton may never reach the airport. Jane? Don Mills? In your dreams. This may play well to 905 voters and to the press who pander to an us-vs-them viewpoint of relations with the City and especially with the Miller regime. However, it’s time for the folks “out there” to wake up and see what funding deferrals mean for them. The Metrolinx Big Move contains roughly $50-billion worth of projects spread over a 25-year period. I doubt that this estimate (leaving aside inflation, changes in interest rates, or capacity limits of the construction industry) is any more valid than the oft-criticized estimates for TTC projects. Somehow we are to believe that Metrolinx has a much more accurate crystal ball than the TTC, but I have my doubts. They certainly do not have a track record to prove it. Queen’s Park hoped that Ottawa would come in for 1/3, but that clearly isn’t happening with a Harper government, and I wouldn’t hold my breath waiting for Iggy, if he ever gets to the corner office, to be any more helpful. We’re not the only city wanting federal handouts. That means Ontario has to find $2-billion a year in new money, and likely another $1-billion to handle future operating costs once the lines are up and running. So far, they had announced $11-billion and change, but that would not cover anywhere near all of the 50-plus projects in The Big Move. A few of these projects are funded and in progress, but many are not. How will their timetables be affected by pushing back the “Top 5” projects? How long will people in the 905 have to wait for their transit services? Debates about funding sources seem to focus on commutes into Toronto, but many of the “Top 15” projects have nothing to do with downtown-oriented travel. Queen’s Park and Metrolinx were also big on “alternative procurement” involving private sector capital, construction and possibly operations. Strangely, the delay in the early projects is all put down to provincial spending constraints, and there’s no word of the bucketloads of capital supposedly available elsewhere. Queen’s Park has a lot of explaining to do, and they need to set out a clear roadmap for transit development. Meanwhile, out in the 905, voters need to wake up. Queen and Bay may be a long way from where they live, and a Toronto rally may seem of little consequence. That bus, that LRT, that subway you were hoping to see soon is still a long way off and it’s not headed your way. The Public Transit Coalition, a recently formed umbrella group for supporters of Public Transit, will hold a rally at City Hall in Council Chambers on Wednesday, April 21 at 6:00 pm. Additional related information is on the TTCriders website. Facebook groups have been created for “Friends of” the various Transit City lines. There’s an excellent post, complete with several links, on Jarrett Walker’s Human Transit blog talking about the fundamentally different way that highway engineers and sustainable transit folk think about questions of “speed”. Their views are totally at odds, and the result when a highway thinker takes on a transit problem may leave much to be desired. Looking at the speed of a trip (or trip segment) may not tell the whole story. In the context of technology debates here in Toronto, some will take issue with the “or” in this article’s title. After all, a subway can be both fast and frequent as we all know. However, part of the total trip is also the access time to service, and that brings us to debates about stop spacing, development patterns and pedestrian-friendly neighbourhoods. The article also links to a piece about streetcars vs buses on Walker’s site. The extensive comment thread covers many aspects of the debate we have seen here in Toronto. One important distinction that Walker himself makes is that the article deals with streetcars vs buses, not LRT vs BRT. He has a separate article on the distinction between streetcars and LRT. NextBus Maps Vanish: Is TTC Embarrassed by Crappy Service? Those who have been following the on again, off again appearance of NextBus information on the TTC have noticed that the route maps are no longer visible, only the next vehicle predicitions for stops. Apparently, the maps showing the locations of the cars were just too embarrassing for TTC management as they show how erratic the service is even on lines with their own rights-of-way and supposedly good service. This is an odd development considering that a rollout of NextBus to all streetcar lines was expected soon, and the maps are an integral part of the product. Most of the streetcar routes appeared for a few days, and even were announced by the Mayor, but they were pulled back from public view. At some point, TTC operations has to learn who they are working for. We hear a lot about customer service these days, but perish the thought we actually find out how bad things really are. If there is anyone at TTC with a reasonable explanation of why we should not see these maps, I want to hear it.